I set my alarm to get up for breakfast on a Sunday. That’s how bad I wanted to avoid the crowds yet I still wanted to try a new restaurant. We were both a little groggy when my alarm went off a little off nine, so it took a while to get going, but once we both got presentable, we headed to campus to the site of the former Maggie’s Campus Cafe. 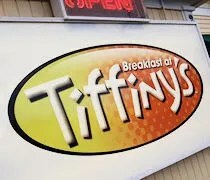 Things are a little different at the new Breakfast at Tiffiny’s. The building is still the same. It still sits just to the west of the intersection of Howard and Michigan near WMU. The thing I remember most about Maggie’s was the smell. Yes, the only time we went to Maggie’s was on a Sunday morning, but the whole place had the stench of beer….you know, the kind that permeates from your pores after a night of drinking. That morning, the place was packed with hangover underclassmen….hence, the reason we got up “early” and tried to beat the college kids. 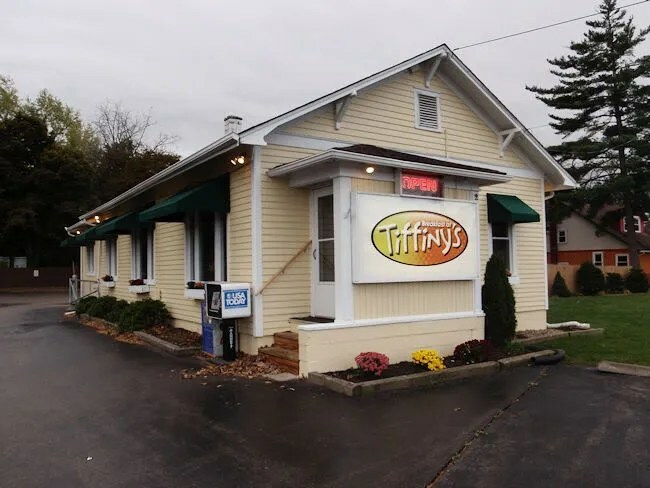 We walked in to Breakfast at Tiffiny’s to find the place has been cleaned up quite a bit. A fresh coat of paint and new carpet gives the place a much warmer feel. Our plan worked. There were only a few tables being used when we walked in. A hostess took us to the back dining area and set us in a table near the back corner. We were left a couple menus while the waitress went to get a glass of OJ and a glass of Pepsi. The menu has some breakfast classics, but it’s also got some unique creations. For Maggie’s fans, The Stew is still on the menu. They’ve also got some breakfast wraps, breakfast pizzas, and the classic omelet menu. 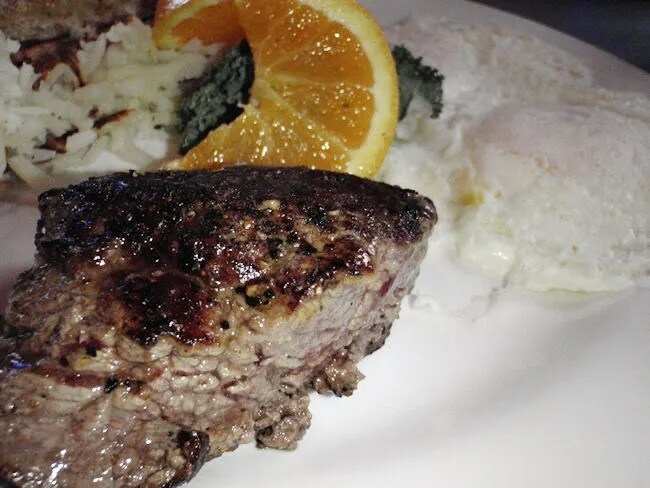 With so many interesting items to choose from, I went to my standby, the Steak & Eggs. The plate, which is a real and rather large plate, was stacked with two eggs cooked over medium, a 5 oz. ball tip steak, hash browns and toast. The steak was actually delicious. Much better than the typical breakfast joint steak and eggs. It was a thick, juicy piece of meat that was perfectly cooked. The eggs were eggs. Runny and delicious. I wasn’t wild about the hash browns but only because they were a little too raw for my liking. I picked the crunchy brown top off and ate that, but didn’t get too far in to the middle. The toast was delicious. I really wanted to ask someone where they got their bread from…..or if they made it themselves, but outside the steak, it was the best part of the breakfast. By the time I got to it, the butter was melted nicely into the slightly crunchy slice of wheat bread. J ordered a cheese egg white omelet. 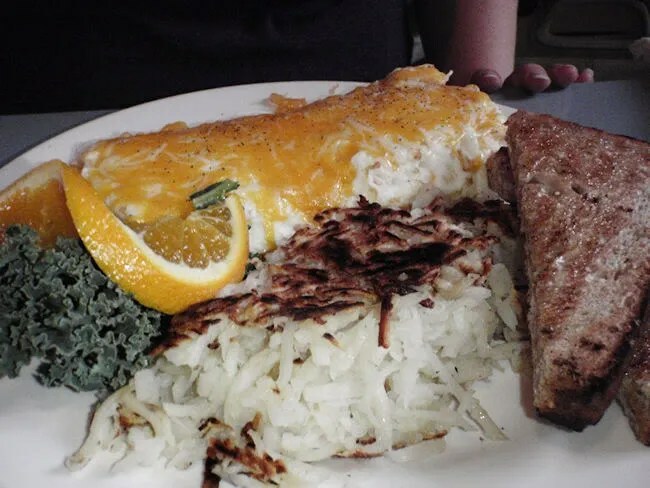 I’m not sure if anyone reading this has hear of LaBamba Burritos or not, but their claim to fame is “Burrito’s As Big As Your Head.” Yeah…that’s kind of how I would describe J’s omelet. It was pretty huge. She dug in to the middle and only ate about half of it. There was enough there for two people and she still had an order of hash browns and toast on her plate. She kind of felt the same way I did about the hash browns and loved the toast. Our bill was just under $18. I don’t think fans of Maggie’s will recognize the new place, but I’m sure over time, they will come to accept it. In my opinion, it’s a pretty big improvement. The food was really good and, oh yeah, did I mention the Bronco Buster Challenge? In my younger years, I would probably attempt it. A dozen egg three topping omelet, three slices of bread, and a pound of hash browns….eat it all and there’s a spot for you on the wall…so far, no one’s made the wall…..I should have tried to become the first 😉 I know Maggie’s will definitely be missed by many-a Bronco, but Tiffiny’s will soon make a name for themselves with the new classes.